Reminds personnel to recycle whenever possible. Helps increase environmental awareness. 3 si..
An effective reminder for your workers to follow the 5S principles, which helps in the "sustain" p.. Remind personnel to clearly display their security badges at all times in the area for confidentia.. Remind personnel to stop for safety reasons while also notifying others that only employees are al.. Effective replacement for a stop sign due to its standardized shape and color. Helps prevent colli..
Mark areas specifically for storage. Helps prevent misplacement or storage in the incorrect area. ..
Label a receptacle as trash only so that recyclable items are not thrown away. 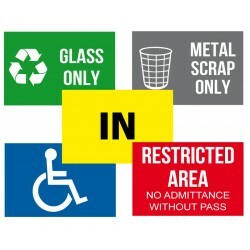 Helps reinforce env..
Help deter criminal activity or conduct violations by labeling areas under surveillance. Increases.. Require visitors to sign in for enhanced security, safety, and traceability in the facility. ..